Are you looking for a natural and easy to care for fall arrangement? 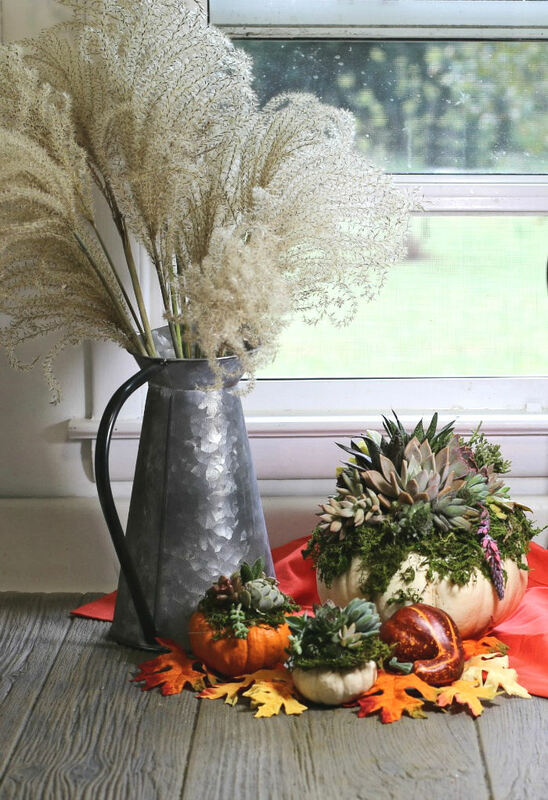 Try making these DIY Pumpkin Succulent Planters. They look great and can be put together in almost no time at all. 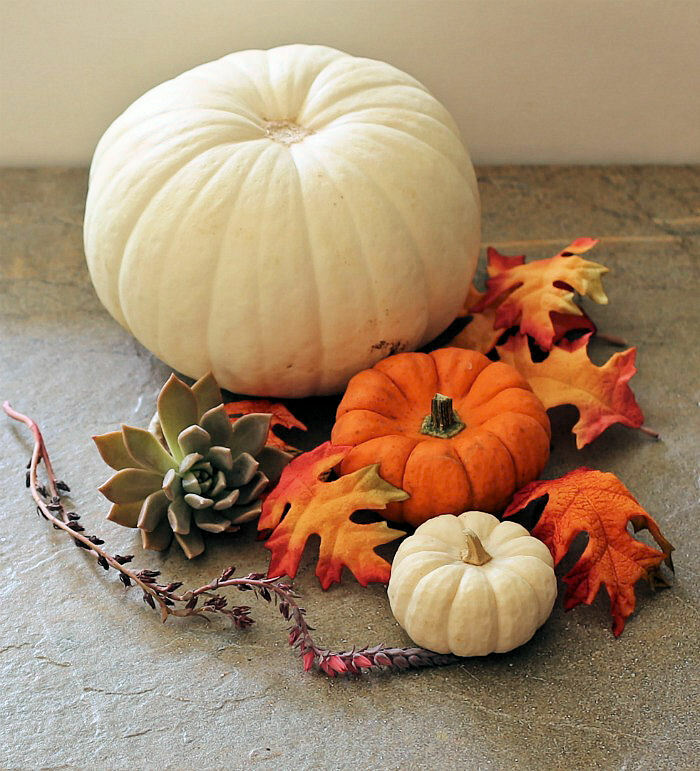 This pumpkin succulent arrangement makes a wonderful fall centerpiece for your Thanksgiving tablescape and can also be used outside to decorate the front steps of your home. 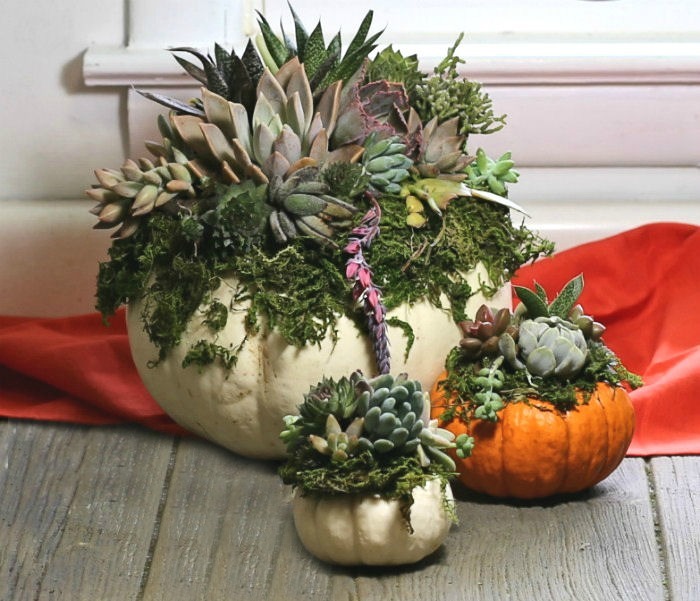 One of the best things about this pumpkin succulent arrangement is that there is no need to actually cut into the pumpkin. What type of pumpkins can I use for this project? 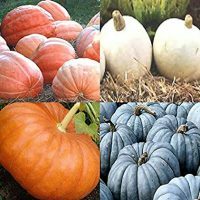 Basically any type of pumpkin will work but try to stay away from the tall slim varieties. You’ll need a substantial area on the top of your pumpkin to lay out your moss and pin the succulents and skinny pumpkins won’t give you this. Cinderella pumpkins work particularly well. They have deep ridges and an exceptionally flat top which makes them idea for this project. I also chose a variety of colored pumpkins for my display. White pumpkins with succulents on the top have a nice contrast and the orange color also goes nicely with the green color of succulents. Where can I get the succulents for this DIY gardening project? Most of the big box stores carry a pretty good range of succulents, but they can be expensive. If you live in a warm area where they grow naturally, ask some of your friends or neighbors if you can take cuttings of their plants. 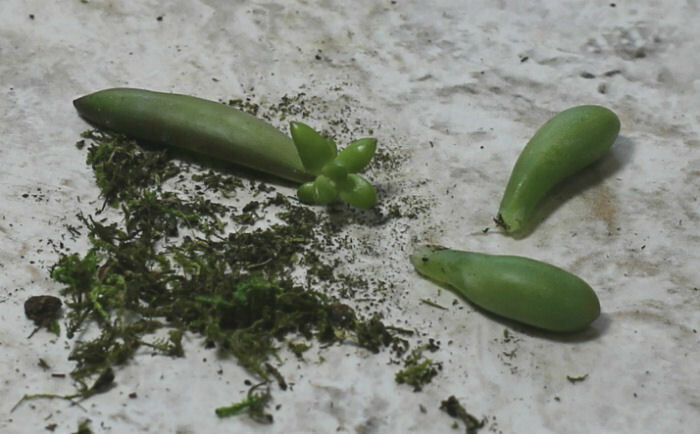 It’s very easy to grow succulents from stem cuttings and even their leaves. One of the tips is to allow the ends to callous, and this is important for this project too. A calloused end keeps the cutting from rotting. I have always grown and propagated succulents, so I had a ready supply of them. I made cuttings from my plants yesterday and trimmed them to size, then allowed them to callous over. I chose various colors, sizes and textures in order to five my pumpkin arrangement the most dimension and beauty. This project is green gardening at its best. It is decorative, uses all natural ingredients and is easy to make. These pumpkin planters feature an assortment of small succulents as well as a good layer of moss over the top of colorful pumpkins. Let’s see how to make them, step by step. 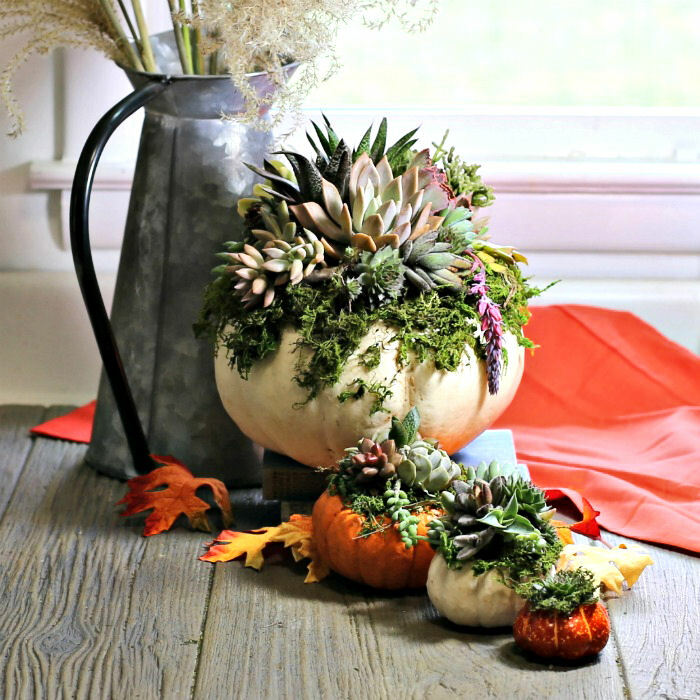 This succulent pumpkin arrangement is the perfect way to decorate for Thanksgiving and would make a really personal hostess gift to take to your round of holiday parties. The design makes a perfect fall pumpkin centerpiece and would be a very thoughtful home made gift for a friend or coworker who loves gardening or succulent plants. Let’s get started on the DIY project! Pumpkin(s) – Choose different colors and shapes for the best effect. I used real pumpkins since I want to plant the cuttings later, but faux pumpkins will also work if this is not your aim. Succulent Cuttings or Plants – Try to choose a variety of colors and types of succulents for the prettiest arrangement. I used a combination of new cuttings and established plants with some tiny roots already growing. Start by getting your work space ready. If you don’t have a dedicated craft table, lay down some butcher paper or newspaper to protect your work surface. Be sure to work in a ventilated area, since you’ll be using a spray adhesive. In order for the succulents to stay on top of the pumpkins (and start to develop roots) you will need some sort of base for them to attach to. We’ll be using green moss for this purpose. 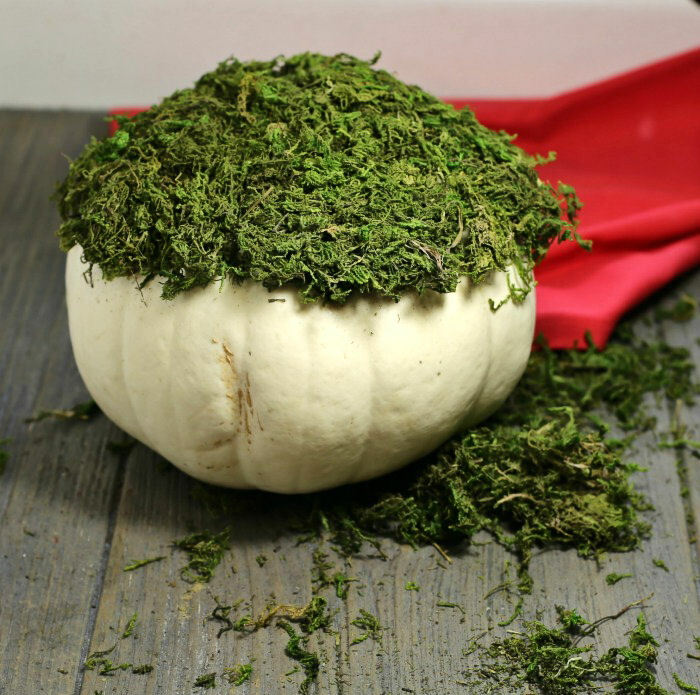 You will want the moss to stick well, so coat the top of the pumpkins with some of the spray adhesive. I found that it works best to work in small sections pressing down as you go. Spray large pieces of moss, and then press down firmly on the pumpkin for a few seconds to allow it to stick well. Fill in areas by spraying directly on the pumpkin until the top has a nice base. Continue working, creating a layer about 1/2 to 1″ thick until the top of the pumpkins are well covered and becomes a bed for the succulents to stick to. 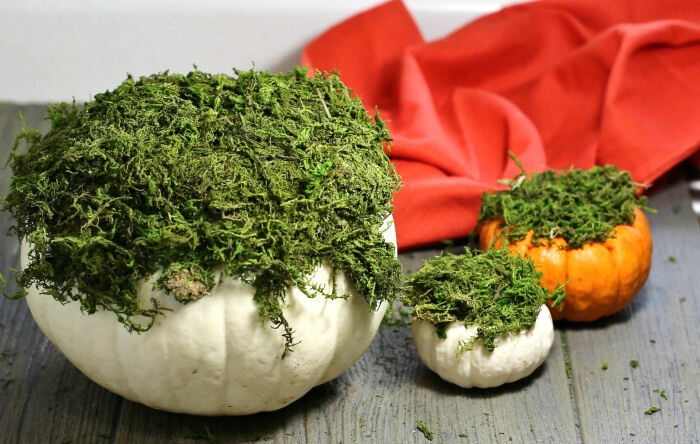 Allow the pieces of moss to trail down a bit here and there so it won’t look so much like a “bowl haircut!” Repeat with all of your pumpkins until they have a nice base to work on. Gather up your succulents, making sure you have a nice variety. Now comes the fun part! 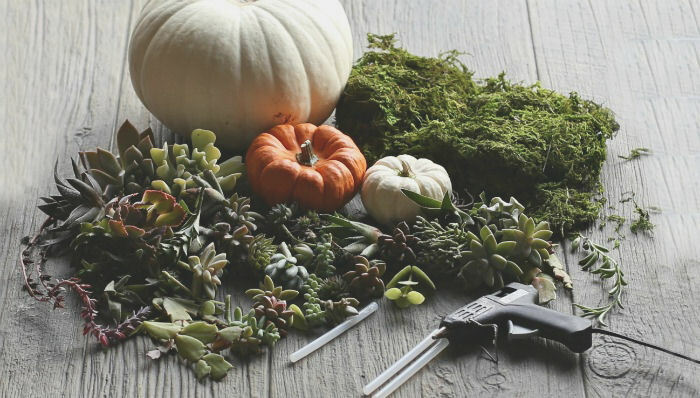 Heat the hot glue gun and gather up your succulents, making sure that they have all calloused over. Group the tallest pieces of succulent in the middle, just off center. Be sure that the glue is hot but wait a few seconds before touching so that you don’t burn your fingers as you press down the succulents. 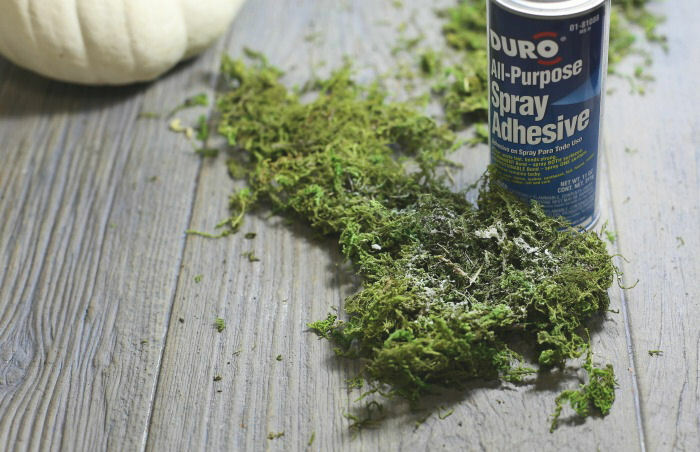 Hold each cutting to the moss with the glue for a few seconds so that it sticks well. If you have any additional items such as cinnamon sticks, seeds, or acorns, intersperse these as you work, too. 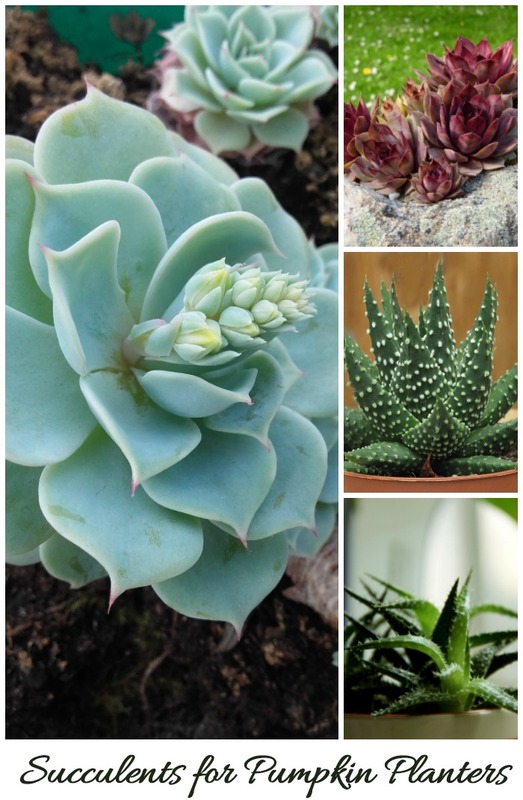 Be sure to use a variety of succulent cuttings in different colors, shapes, sizes and textures. This adds more interest and charm to the arrangement. Work from the center outward, using the hot glue to attach the cuttings, making sure they are packed closely together. This not only makes it easier to work, but allows you to see how the arrangement is progressing as you work. Keep working until the top of the pumpkin is full and looks the way you want it to. As you are working, aim for a mounded look, placing the smaller pieces at the front and very front pieces angled to the outside. 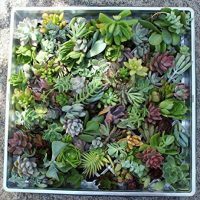 Make sure that you have plenty of succulent cuttings so that you’ll be able to fill in all the spaces as your arrangement starts to take shape. If you have too many, you can plant them in soil later. I used echeveria neon breakers for one of my center plants and it was in flower right now, so I was able to add a pop of color right at the front of my arrangement. If you have a succulent that is a cascading type, attach them firmly to the moss with the glue and then allow them to fall down over the sides of the pumpkin on the outside edges. 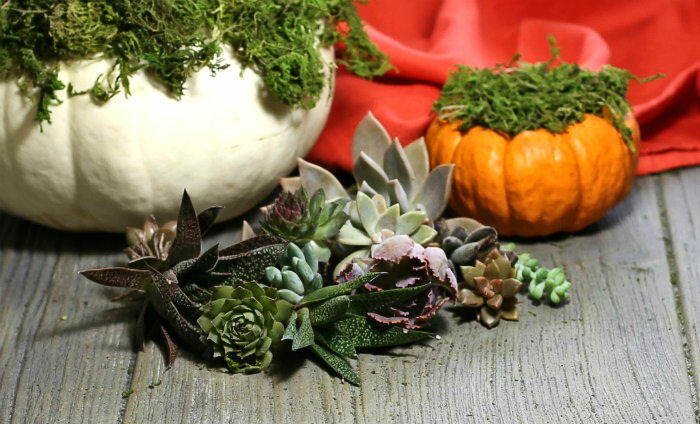 Continue working until all of your pumpkins have succulents on the moss the way you would like them to look. The small planters look nice if you choose a succession of sizes to balance the display. What happens if leaves break off the succulents as you are working? This is no problem at all. Just let the ends of the leaves dry off and then lay them on some cactus soil. They will make baby plants in no time. See more tips for getting plants for free here. It’s a good idea to allow your arrangement to just sit for a day before you water it. This will make sure that the glue is nice and firm and won’t be dislodged from moisture. Once you have your arrangement finished, you’ll want to place it where it is protected from any harsh elements, particularly frost and freeze. Succulent leaves are full of water and can be damaged easily. Try to keep the whole thing from getting too much water or the succulents and pumpkin may quickly rot. Spray the succulent cuttings at least once a week to hydrate the moss and to encourage any new roots that might form. Try to avoid allowing water to pool near the stem. The amount of water needed varies depending on your climate but generally mist it every few days, getting the moss moist but not soaking wet. 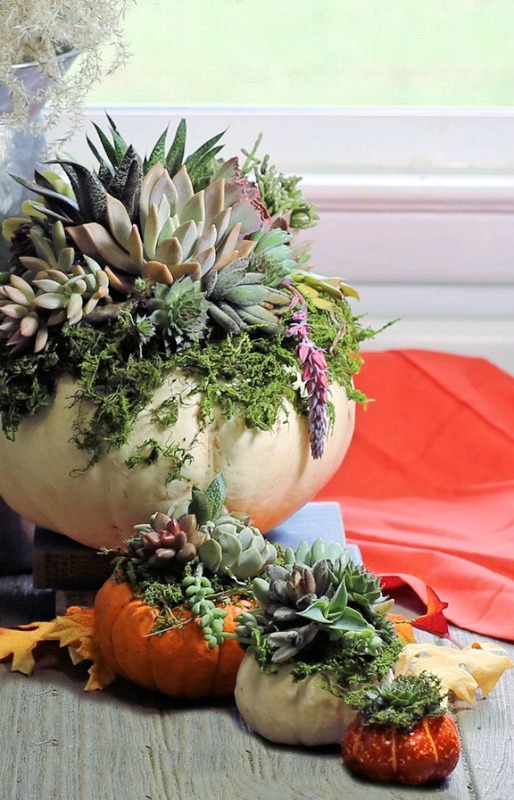 Treat this pumpkin arrangement as though it is a houseplant. Place it in a spot that gets bright light – near a window indoors, or on a sheltered porch or deck. How long with this succulent arrangement last? Since you are not cutting into the pumpkin, it will likely last for a few months as long as you give it the right conditions and mist it regularly. You might discover that the cuttings will start growing into the moss and might even attach themselves to the actual pumpkin. Once the pumpkin starts to break down, carefully cut off the top. Then you can either plant the whole thing (pumpkin piece and all) into a pot that will hold it, or cut it into pieces and plant into smaller pots. How big will those tiny succulents grow? The succulent plants that you get at Lowe’s and Home Depot are normally sold in a tiny pot. Succulents are generally slow growing and when grown as houseplants, they will stay quite small. But under the right light and temperature conditions, particularly if you can grow them in the soil outside, some can grow really large. 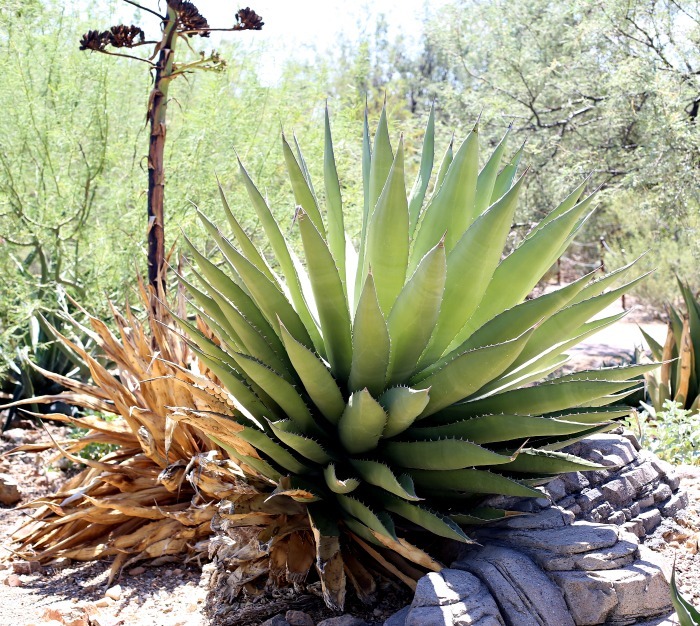 You can buy a potted agave and plant it outdoors in California or similar zones and end up with a monster plant like this one that I saw recently in the Sonoran Desert Museum Park! The eventual size depends on the variety, or course. In low light, they can get tall and spindly but will remain compact in good light. Once they become pot bound, they will send out “pups” which you can remove and pot up as separate plants. If you repot the mother plant in a bigger pot, it will eventually grow to fit that size pot. Aloe – Another tall plant with a light green skin. Needs drying out for longer because of the aloe in the leaves. Christmas Cactus – Has a draping effect that looks good down the outside of the pumpkin body. It might even flower before the pumpkin starts to break down! Sedum – Autumn Joy is one that I have right now in flower. Cuttings can be taken in longer sizes for the center of the arrangement. Sempervivum (hens and chicks) – These neat little rosettes are prolific in the garden, so you can get a lot of tiny babies to use. Senecio – String of pearls, burros tail are two examples, both of which have a nice draping effect. Crassula – Aeonium Haworthii is one variety- has glossy leaves with deep red margins. Kalanchoe – Thin leafed succulent with long lasting flowers. Easy to take from cuttings. Lithops – living stones – plump and short. They make a good plant for the outer layers. 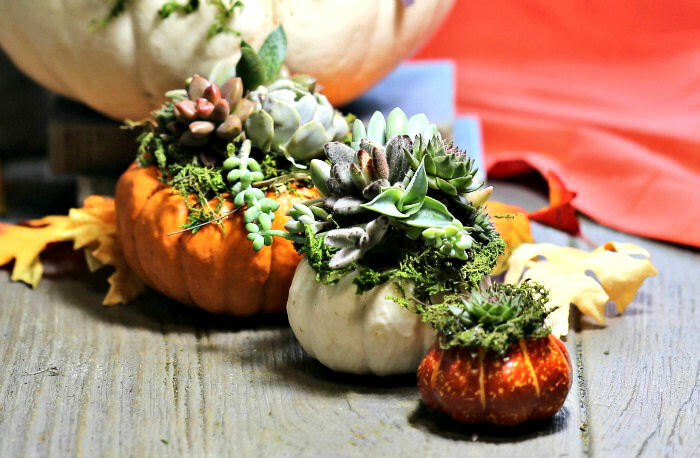 Would you like a reminder of this DIY Pumpkin Succulent Planters project idea? Just pin this image to one of your Pinterest home decor boards so that you can easily find it later. 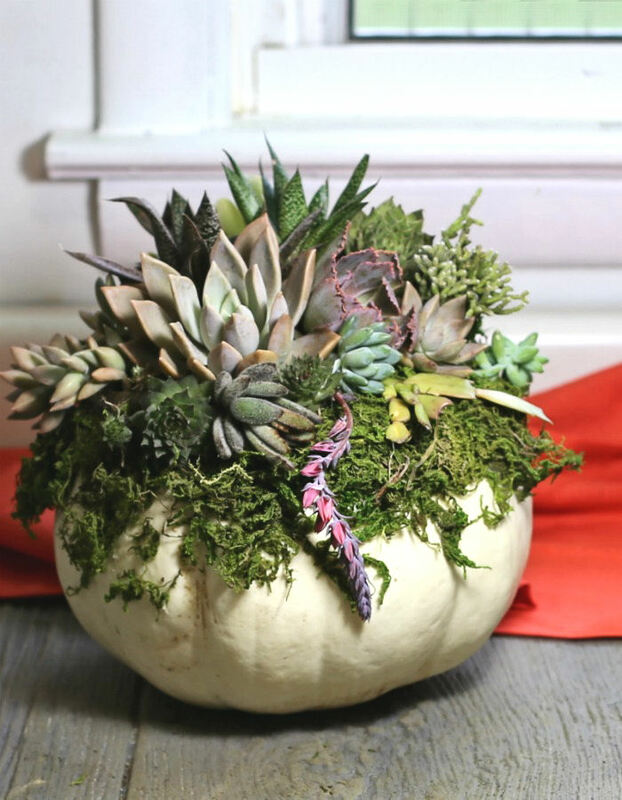 This DIY Pumpkin Succulent Planter uses fall pumpkins, moss and pieces of succulents to make a unique and beautiful fall arrangement. Succulent Cuttings or Plants - Try to choose a variety of colors and types of succulents for the prettiest arrangement. Trim your cuttings and allow them to callous over. This can take a day or two. It's and important step. This allows the cuttings to dry out so that they don't rot. 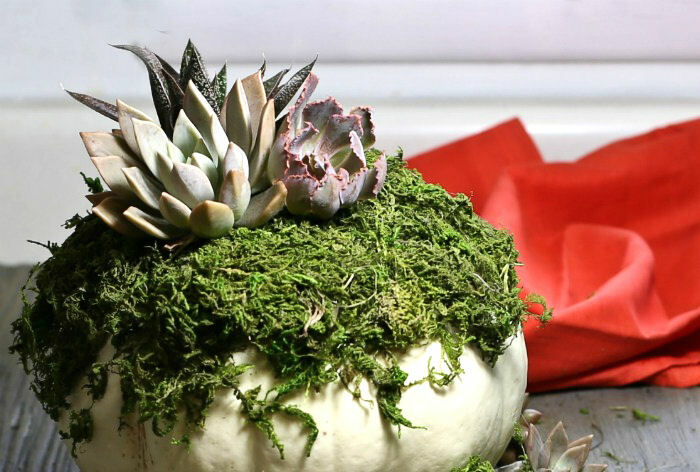 Spray the top of the pumpkin with spray adhesive and attach the moss making a base for the succulents to sit on. Start from the center with the tallest items and work out. Fill in all the spaces and use the smaller pieces at the front. Arrange the very last pieces outward. Display indoors in a bright location near a window, or outdoors in a porch or area protected from the elements. Mist every few days to keep the moss moist but not wet. The arrangement should last a few months. When the pumpkin starts to break down, cut off the top along with the succulents and plant the whole thing in a large pot, or break it up for smaller pots. 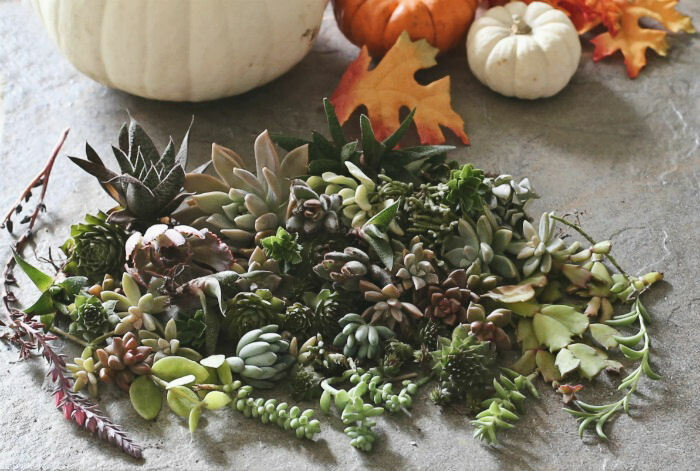 Tip: Can't afford the amount of succulents that you need to complete this project? The answer is easy! Grow some of your own. Succulents are very easy to grow from a single leaf placed in soil. I a few weeks, you can have baby plants that you will be able to use in lots of projects. How long should I let the cuttings callous over before using them? The cuttings will sometimes develop a callous in just a few hours or over night. If it is humid in your area, this can take a couple of days. What does it mean if my succulent cuttings get long and spindly as the weeks go on? Spindly plants mean that they are not getting enough light. Move the arrangement closer to the window and they should become more compact in size. What is the right potting mix for the succulents when I am done with the arrangement? Succulents need a well draining soil. Try to find a cactus and succulent mix for them if you can find it. Can I save my arrangement if I over-water it by mistake? You should try not to let the water pool in the center, but if you do find that it looks limp and mushy, hold off on watering until the top is very dry then mist lightly. Sometimes this will help it to recover. Will the hot glue hurt my succulents? The hot glue will burn an area of the succulent where it touches but will not harm the rest of the plant. The succulents will still root and grow in the future. Floral glue is also an option of you are worried about this. It is also known as "cold glue." 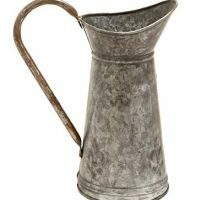 Deco 79 38177 Metal Galvan Watering Jug, 10" x 12"